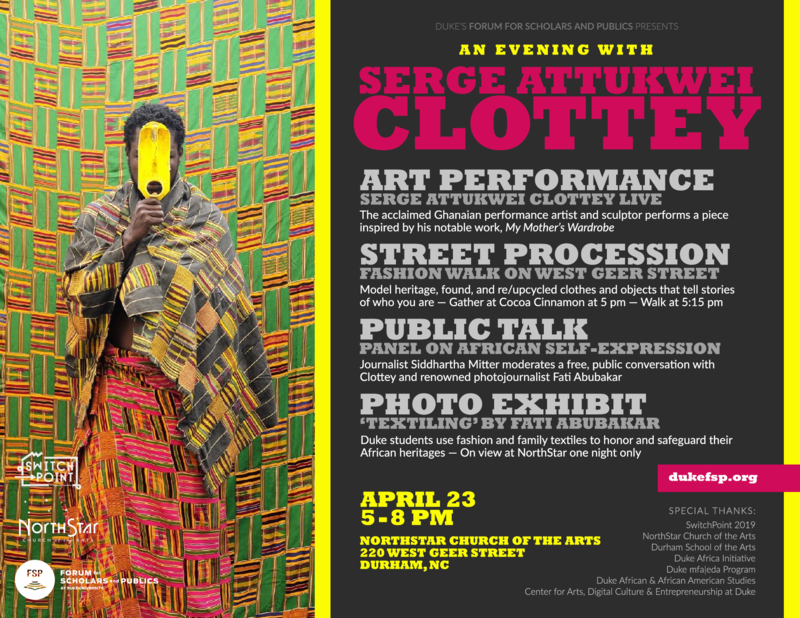 Ghanaian artist Serge Attukwei Clottey photojournalist Fati Abubakar will perform and exhibit their work as part of this event celebrating art, fashion, music, and self-expression hosted by Duke's Forum for Scholars and Publics. The evening's events at NorthStar Church of the Arts will include a fashion procession, a live performance by Clottey, a discussion about African art and expression with Clottey, Abubakar, and Siddhartha Mitter, and a chance to experience Abubakar's newest photography exhibit, "Textiling." Both Clottey and Abubakar will present at SwitchPoint 2019, IntraHealth's annual conference celebrating the intersection of global health, technology, and humanitarian innovation. For more information, and to register for the event on April 25 & 26, click here.